E-Business HTML Email Template Created by Bedros. This templates have specific characteristics, namely: E-Business has features such as High Resolution: No, Compatible Browsers: Gmail, Yahoo Mail, Microsoft Outlook, Thunderbird, Hotmail, Apple Mail, Columns: 3 . You can use this E-Business HTML Email Template on Marketing category for Aweber, business, campaign monitor, constant contact, corporate, ecommerce, email template, gallery, mailchimp, newsletter, portfolio, product showcase, retro, sales, vintage and another uses. 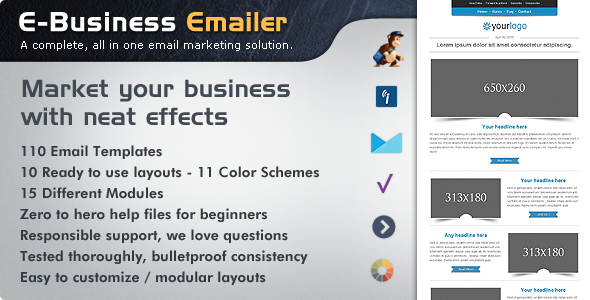 E-Business is a unique, colorful premium email marketing template which comes in 11 color schemes and 10 ready to use prebuilt layouts for each. Following email marketing best practices ,Tested with Litmus and works perfectly with mobile devices and all major email clients, ensuring full consistency. E-Business HTML Email Template (s) easily fit marketing, business, promoting, portfolio, computer hardware & software, hosting companies, design agency, financial services, communications, technology & hi-tech, etc… Possibilities are only up to you. Live Previews are encrypted for security reasons , so they may take a while to load, please be patient, it will worth it. Please also keep an eye on the SUPPORT section above the Preview Image on top for UPDATES and helpful information. E-Business HTML Email Template (s) comes with bulletproof, completely Valid </html> code. Renders perfectly across all browsers, desktop & mobile email clients. Business, Portfolio, Gallery options, Internet Marketing, Promoting, Automotive, Computer Hardware & Software, Hosting Companies, Communications, Financial Services, Technology & Hi-Tech, etc.. Possibilities are only up to you. 10 unique layouts with 11 color schemes. All included in seperate folders. A total of 110 ready to use and valid HTML Email Template. Those previews are encrypted for security reasons, they may take a while to load, please be patient. Extra “AllinOne” Templates with all 15 modules. All included in seperate folders with corresponding color themes. By using those easy to modify/flexible modules, building your very own layout is just easy as copying/pasting modules(tables). ALL of the templates have both Inline and Embedded CSS Versions for your comfort. Layered PSD Files of any graphical element. All JPG and PNG sources. All in seperate folders with corresponding color themes. Instructions for making changes to the both content and presentation, customizing/modifying your templates. Business Email Format – Renders perfectly on all email clients and browsers starting from old browsers such as Internet explorer 5.5 till new email programs like Outlook 2013 and Thunderbird 17. Clean, Modern & Most importantly Unique design. 10 Unique Layouts with 11 color schemes , 110 ready to use HTML Email Template. Comes with 15 different modules. Besides prebuilt layouts , You’ll also have all of the modules together with corresponding color schemes in seperate folders , which allows you to built your custom layout with ease. Easy to modify. Flexible table construct allows you to build your very own layout if you wish, building a custom layout is just easy as copying & pasting your favourite modules (tables) with the comfort of “AllInOne” templates. You can delete or duplicate the modules very easily.You can copy/paste content blocks (tables) from one layout to another to create your very own layout. You can very easily delete/duplicate the modules(tables) as you wish. Easy to update (just enter your text) Company Slogan / Motto / Quote sections for both Header and Footer. Layered PSD Files included for the JPG and PNG images. You can easily on/off any graphical effect. Thank you very much visiting e-Business email template.